Conducted by Diana Tolmie, The Australian Saxophone Orchestra aims to represent their country with their unique sound and musical interpretation of the saxophone orchestral medium. 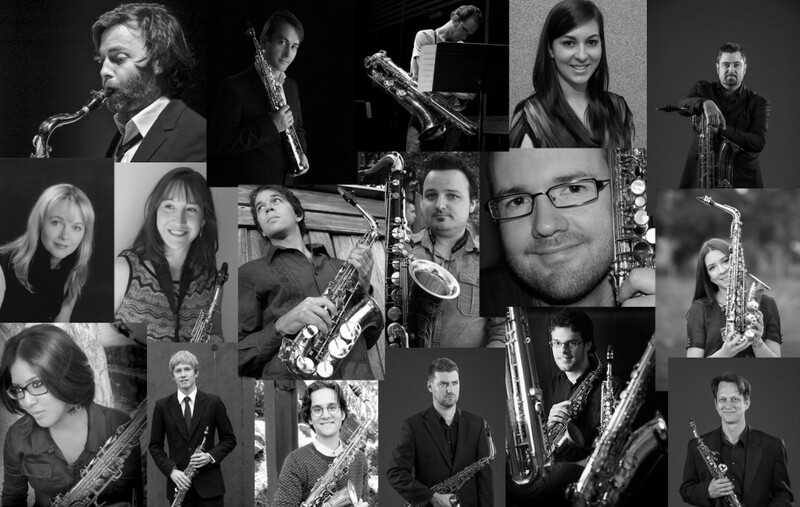 Conducted by Diana Tolmie, The Australian Saxophone Orchestra includes professional Australian saxophonists sourced from all around the globe. Performing new works commissioned especially for this commemorative event, The Australian Saxophone Orchestra aim to represent their country with their unique sound and musical interpretation of the saxophone orchestral medium. World premiere at the World Saxophone Congress, Strasbourg. This work deals with an interesting combination of notated and through-composed, versus semi-improvised and aleatoric elements. A layered melody spirals and intertwines its way through the ensemble textures and parts. These ensemble parts explore various concepts of directed improvisation focussing on the complex rhythmic, harmonic, dynamic and gestural detail created in the layering of semi-improvised voices. These aspects combine to create an unique sound world that represents an idiomatic yet very exploratory approach by the composer. The concept is to create a sense of individual freedom and control for the individual performers, while at the same time clearly contextualising all ‘free’ elements in a melodic, rhythmic and harmonic structure. First Light at Uluru has been composed for the Australian Saxophone Orchestra and will receive its world premiere performance at the XVII World Saxophone Congress in Strasbourg. First Light at Uluru is inspired by the spectacular sunrise of Uluru – Australia’s most famous icon. Also known as Ayers Rock, it is a giant ‘red rock’ in the middle of Australia’s desert, with the ground made up of red soil. Uluru is sacred to the Anangu, the Aboriginal people of the area. Uluru means ‘Earth Mother’, and the 8.6 square kilometer rock is believed to hold a powerful energy source and marks the place where dreamtime began. First Light at Uluru begins with soothing air vibrato effects reflecting the peaceful and silent atmosphere of Ayers Rock, where only the soft wind gusts in the far distance can be heard. At dawn, the giant red rock changes colour and produces an illuminating red and orange glow. This is represented by multiphonic and quarter-tone trills gradually emerging to create a variety of colouristic and textural layered effects. As the sun slowly rises, slow, dream-like melodies gradually build to chorale-like passages, showcasing the beautiful, lyrical sounds of the saxophone orchestra. Zaum is inspired by the work of the Suprematist painter Kazimir Malevich. The word was used by Russian Futurists to describe their linguistic experiments. Zaum can be defined as experimental poetic language characterized by indeterminacy of meaning. The abandonment of logic and the prevalence of irrationality. This work for saxophone orchestra reads/sounds like a painting with abstract blocks and finely detailed reedwork providing the background texture.